Recently, Elizabeth from @TravelWineChick sent me a link to an article titled, “Canned Wine Sales Up 43% in America”. Even though I can clearly see how this alternative packaging would be ideal in many situations (campsites or beaches where glass isn’t allowed, etc.) I was still surprised by how popular canned wine has become in recent years. That’s right folks, Oregon Pinot Noir in a Can. 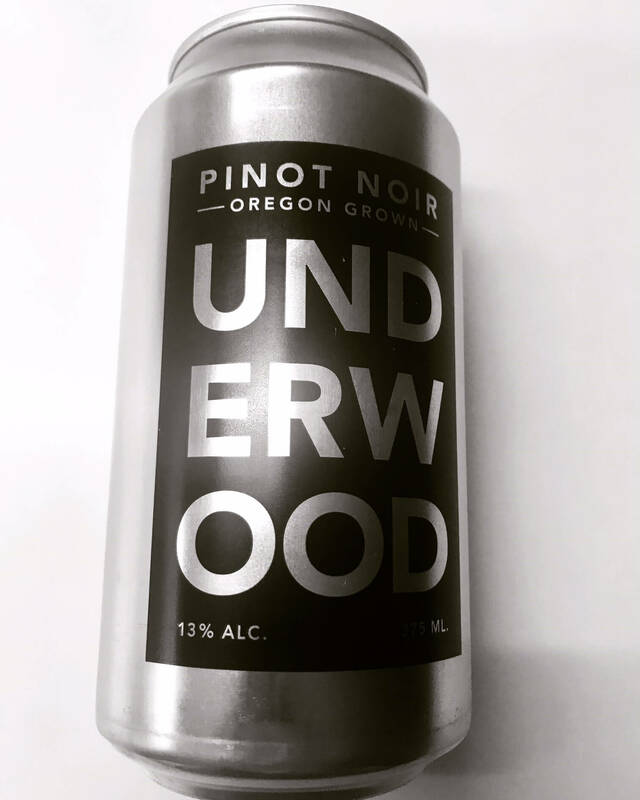 A few days ago I broke down and purchased a single can of Underwood Pinot Noir from Union Wine Company. I was doing a grocery run for my mom in Northern Arizona, and while in Safeway (Von’s if you’re a Californian), I spotted the elusive can of wine. Being a wine enthusiast, I love the glass bottles. I love the cork, the artistic labels, and the feeling you get when you open a beautiful bottle of wine. This was a silver and black can. My hardwired perceptions, assumptions, and expectations of my bewitching wine had been reduced to what could easily overlooked as a can of beer. One can of wine = half bottle of wine. A single can of Underwood Pinot Noir contains 375ml of wine, which is half of a standard 750ml bottle. For around $5, depending on where you purchase it, you get two decent sized glasses of wine. Elizabeth was absolutely right when she wrote, “Packaging and marketing always influence our perceptions”. I wanted to give it a fair chance, without snubbing the can. And, I have to admit, it wasn’t bad at all. It was light-medium bodied with a pretty cranberry hue in the glass. Yes, I poured it in a wine glass… I just wanted to see it. And, if I did camp (I love not camping! ), I’d gladly drink it out of the slightly chilled can. Just like any red wine, you don’t want it too hot or cold. While it wasn’t out of this world amazing, it was admittedly good, and perfectly drinkable with an overall smooth balance. Had I done a side-by-side, blind tasting next to other Pinot Noir’s, all poured in a quality wine glass, this can would’ve rivaled any of them at the same price point. I can absolutely see the practical side of this type of packaging, just like screwcap closures, which in no way determine the quality of the wine. I’ve purchased many bottles at Trader Joe’s in the $7-$12 price range that had a weird thing about them. You know what I’m talking about… that weird, tinny finish you can’t quite place and screams I’m weird, cheap bulk wine and I probably have an even weirder additive that you’ll never know about because they don’t have to list the ingredients!